Blog home > Conservation > To share or not to share? Courtesy. There are lots of photographers out there who have helped me in the past and I feel obliged where appropriate, to return the favour. Awareness and appreciation. There is an argument to say that facilitating close contact with for example, a red squirrel, will nurture a greater connection with that species and the habitat on which it depends. Money. Some might consider that financial gain is a dirty justification for exposing secret sites but without that revenue stream, many photographers, and in some cases, a wider spectrum of local businesses, would find it difficult to earn a viable living. Red squirrels (and puffins and sea eagles and otters) pay. I have to say that my own experience with fellow photographers has been mixed and in hindsight I might have handled certain situations differently. Several years ago I was put onto a reliable site for a rogue male capercaillie. These are birds which, rather than retaining their inherent wariness of people, are inclined to approach anyone (or anything) that wanders into their perceived territory. They are extremely rare in the UK, confined to the pine forests of northern Scotland and are ordinarily, susceptible to human disturbance. They are also protected by law (see below). That particular year I’d spent 3 weeks in Norway trying to photograph capercaillie without any success so this tip-off on my return was very timely and very welcome. After several visits, I’d got my shots. A good friend who was just completing a book project asked for the location and after consideration, I took him to the site and he too secured some nice images and celebrated this rare scoop on his blog, mentioning my involvement. You can probably guess what ensued. I hadn’t been asked to keep the site secret, but was nevertheless inclined to do so out of respect for the colleague who gave me the information and of course, to avoid unreasonable disturbance to the bird itself. The phone started ringing and if I’m honest I fudged my response to several colleagues, some of which I’d known for years. What was perceived as my less-than-helpful attitude resulted in accusations of arrogance and selfishness. One photographer threatened to report me (I’m not sure who to) on the basis that I didn’t own the birds, the RSPB did! Fast forward a few years and this site is now out there in the public domain – blogs, forums and GPS data has expedited what would have been a slow, organic process not so long ago. For the most part, the capercaillie in question (now in his twilight years) seems to have coped well with the attention and the forest in which he breeds is bucking the downward trend in capercaillie numbers. 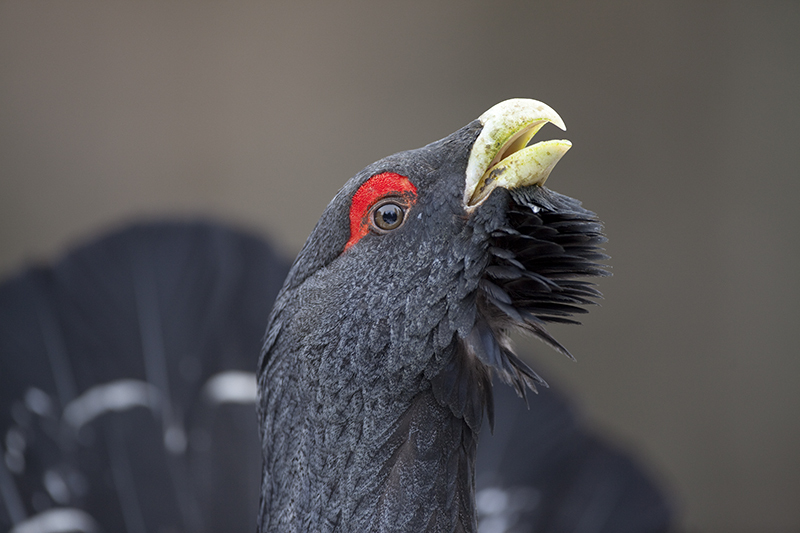 This story ends with no major obvious consequences, unlike other rogue capercaillie which have met premature deaths at the hands of dog walkers, or more recently, due to an alleged bash on the head from a photographer’s tripod. Perhaps as a consequence of this particular incident, photographer disturbance to ‘rogue’ capercaillie is now being monitored much more closely. The dilemma then is how to encourage and where appropriate facilitate, enjoyable encounters with sensitive species, the principle of which has undoubted benefits, whilst being respectful of the subject and those who seek to protect it. It’s a thin line and I’m not entirely sure I could articulate where it should be drawn, but I think most photographers instinctively know the difference between right and wrong. Or at least they should do. Competition within this tiny industry has cranked up the appeal of iconic subjects such as capercaillie and otters. Ironically, some of the most refreshing imagery I’ve seen of late is of common subjects – toads, foxes and geese. There’s perhaps a lesson in there for all of us. The Wildlife & Countryside Act 1981 (as amended in Scotland) states: It is an offence to intentionally or recklessly disturb any wild bird listed on Schedule 1 whilst it is building a nest or is in, on, or near a nest containing eggs or young, or whilst lekking. I am one of the fortunate beneficiaries of Pete’s generosity, because he took me to the site and enabled me to get some excellent pictures of the ‘rogue’. I’ve not divulged details of the site to anyone but before I sound too smug I have to say I doubt I could find it again anyway! I agree Pete, it is a tricky issue and one which I have encountered myself. I have a handful of photographers who I trust enough to divulge locations, in the knowledge that they will give the subject the respect required. However, there is a breed of pushy photographers who don’t want to put in much effort and are only interested in getting the image for themselves. I guess we sometimes learn to differentiate between the two the hard way. I’ve seen many people at this bird and most people (such as yourself) act in a responsible manner (e.g. keeping to tracks, allowing the bird to come to them, moving away after a short period and staying out during the breeding period). What is incredible though are the number of people with top of the range equipment who seem to show no respect for the bird, its habitat or other birds in the same area. I have seen photographers pushing the bird with feet onto the road, groups trying to flush him from the woodland and others hitting the bird with a tripod when he got too close, not to mention those who visit the site during the critical breeding season and risk disturbing other birds in the surrounding woodland. What’s more important, an image of this bird (which let’s face it will be pretty much the same as all the other images of this bird) or the welfare of a species which still faces possible extinction in this country? Whilst I can appreciate this dilemma, fortunately it’s not one I have to deal with, as my main venue is a local council run country park. Since this is a public facility, I have to share it with other people ‘enjoying’ all manner of recreational activities. I consider part of the photographic challenge is to get images that appeal (to me, anyway) without signs of the public’s presence – or behavior – and the assorted evidence of ‘hand of man’ in the background. Accessing this location by pedal bike is a 15 min ride that helps me to keep fit – and, unlike motorised transport used to get pics of more ‘exotic’ species, in faraway places – it’s a somewhat lower carbon option. I accept that this is hardly ‘wildlife’ photography to many people, but trying to get half decent (and maybe different?) – pics of very common species is something that certainly keeps me engaged / occupied. I find the whole “Wildlife Photography Grand Tour” rather perplexing. The “I did polar bears last week, next week I’m doing snow monkeys and the week after that it’s capercaillie” makes me wonder if this is about photography at all and is actually about box ticking and bragging rights. If you are photographers and you can’t find wildlife to photograph, then go and find something else to photograph, there are other subjects you know. If you are wildlife watchers then go looking for wildlife armed only with your binoculars and view your chosen quarry from a distance. I thought “Do Not Disturb The Animals” was a golden rule but that doesn’t appear to be the case here. Can you imagine what’s going to happen if Lynx get re-introduced? A timely, thoughtful piece Pete. I sometimes shake my head when reading various reports by SNH, RSPB, etc., regarding Caper conservation and of course the first thing they do is place a nice close up photo on the cover. A few pages in you then normally find a paragraph regarding disturbance by photographers….hey ho.